FAQ: Can a water bladder holding dilute solvents? Question: I'm looking for a 150,000 gal bladder suitable for water containing dilute solvents. This is for short term storage, typically for a couple weeks at a time. Basically we want to store water, but with the potential to contain a fraction of a percent chloroform at ambient temperature. Can you tell me if this size is available and what material (fabric) options you may have? Answer: Thank you for contacting us! 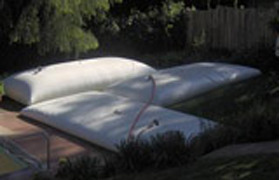 We do have several large scale Water Storage Bladders available, including sizes up to 210,000 gallons. This will include a 150,000 gallon bladder that can be used to successfully store the liquid you require inside your tank. Fabric options for the water storage bladder tanks will vary depending on the type of liquid you are looking to store in the tank, storage location, and intended storage time. For liquids such as the ones you have mentioned here, an MSDS (material safety data sheet) will be required to help us find the best option for your location. Fabrics may change in weight or in thickness depending on your specific storage application. As mentioned above, we do offer several large capacity bladder tanks to help meet your storage location and requirements. These tanks are made in sizes ranging anywhere from 25,000 gallons to 210,000 gallons for bulk liquid storage. For the 150000 gal Water Storage Bladder tank that you have specified, sizing for the tank will typically be around 61' W x 62' L x 5' H. If these dimensions will not work in these locations, please let us know and we can see if there are additional sizing options for these tanks that may work better for your location.